MICKLE JOINS THE 2015 EMEX! 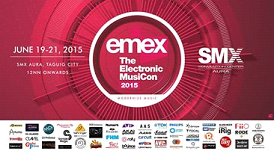 MICKLE joins this year’s Electronic Music Expo and Convention (EMEX) to be held at the SMX Center of SM Aura in Taguig City from June 19 – 21, 2015. A new name in the market, MICKLE is a brand of dependable and reliable sound mixers that is priced reasonably lower when compared to other known brands now available in the market locally. Solely distributed in the Philippines by Panvin International, MICKLE’s aim is give quality electronic sound mixers without making a hole in your pocket. From simple sound mixer set-up – 2 to 4 channels (starters) to 18 channels set-up (mid-level), MICKLE has a unit for your need. Introducing into this event is his professional mixer board which is comparable to the one being used in big concerts or dance parties. The professional board set-up has a minimum of 22 channels and increases in features as you go up with your channel needs. When asked about their expectations in joining this event: “MICKLE is a good and reliable brand. True that there are other companies providing the same thing but we are not afraid to go head-to-head with them because we (Panvin International) believe in what it can offer”, as stated by Mr. Rahul Daryani, Panvin International. The Electronic Music Expo and Convention is a yearly event where different sound suppliers are placed in one spot and showcase what they can offer to the buying public. Known and newcomers in the market of electronic sound equipments are presented to the scrutiny of the dynamic attendees. This year it is to be held at the SMX Center of SM Aura in Taguig City. From June 19 till the 21st, SMX Center will open its doors to those who wish to know what is new and latest in the world of electronic sound business. “Joining this event will open doors for us and make MICKLE the new word of mouth when it comes to professional sound mixer needs. We are good in our word and equipment! Trust us when we say, having the best sound mixer doesn’t have to put you at the negative budget-wise”, says Rahul. This entry was posted in Uncategorized and tagged EMEX, Mickle. Bookmark the permalink.